BALADA & CO at imm cologne 2017 | BALADA & CO.
Munich, January 2017. This year once again, the young design company will be revealing its new products at imm cologne. BALADA & CO. will be premiering a collection of suspended lamps. The manufacturer has been selected by Kölnmesse to exhibit as part of the new segment Pure Studios in 2017. BALADA & CO. embodies aesthetics that create perfection in ambiance through clear, sleek shapes and colors. Supreme quality and innovative materials such as FENIX NTM® Nanotech Matt Material underscore this young design label‘s demanding standards. With passion and great attention to detail, BALADA & CO. creates lamps in collaboration with regional businesses and workshops, fostering design Made in Germany. Thanks to high quality haptics and sublime forms, these chic lamps can be universally used in any domestic or work environment – be it a newly built apartment, a space with historical flair, or even a Scandinavian setting. In 2016, BALADA & CO. launched with its first lamp collection, consisting of four standing and table models, each customizable with individual colors and innovative materials. In addition to adding new colors and materials on the lamps to the debut collection, in 2017 the Munich company will be premiering BALADA & CO.’s suspended light collection “Vintage Pendants” thereby extending the design concept onto the ceiling. The lampshades on the suspended models – just like the standing and table models – come in various sizes in Classic and Vintage, thus creating a perfect ensemble in concert with the counterparts on the floor. In the Vintage Collection, the lampshade body is comprised of manually-shaped square steel around which an elastic matt crepe tissue is stretched. The striking three-dimensionality and quality of the shades becomes particularly visible when the light is turned on. The material becomes translucent and the square struts comprise an accented light contour. The versatility in materials means the collection can encompass fashion trends like the houndstooth pattern. Additionally, these materials can be removed and washed! The Classic lampshades are created at a local workshop. Like their counterparts on the floor, they receive the characteristic BALADA & CO. diffusor made from powder-coated aluminum. Upon request, the diffusor can project onto the ceiling via a clear illuminant to show an interplay between light and shadow. The conjunction of high quality chintz fabric with matt or velvety shimmering texture and the gritty powder-coated aluminum diffusor provides for a touch of industrial loft charm of comfortable character. “We are excited to have an opportunity to present our designs to an international audience again at the 2017 imm cologne. Last year, we worked hard to continue forward with our workshop concept and are joyed to see the great reception our products have among buyers, journalists, and customers alike,” says Christian von Petersdorff. A native of Munich, he founded the young design company in 2015 and oversees design. His credo: Sleek, clear and discreet – yet with tremendous attention to detail. Design entrepreneur von Petersdorff made the transition from consultant to producer, developing from a solopreneur into a label for exclusive lamp design in just a few months. 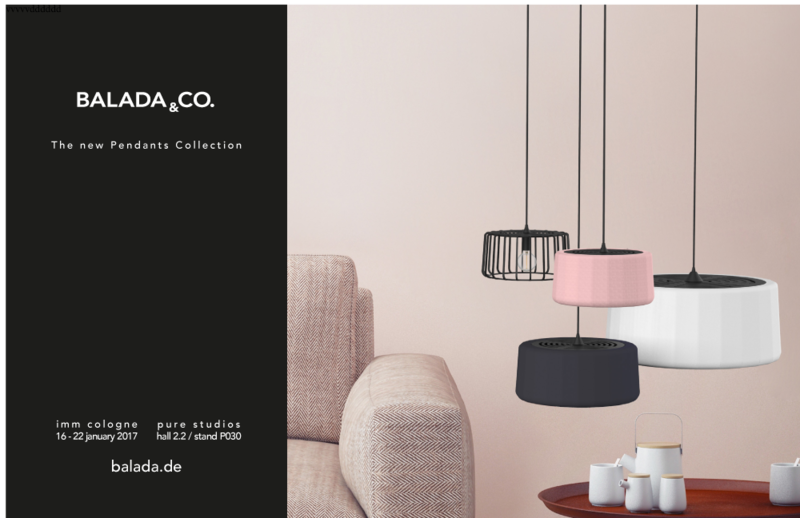 After the successful market launch in Germany, Switzerland, and Scandinavia in 2016 and a terrific trade fair appearance at Light + Building 16 in Frankfurt, the brand BALADA & CO. has now been nominated by the German Design Council for the German Brand Award 2017. 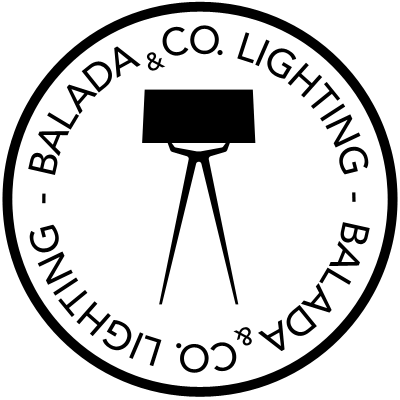 From 16 to 22 January 2017, you’ll find BALADA & CO. in Hall 2.2 at Stand P030 in PURE STUDIOS.